When you watch a conference talk you see a final product. Often times, the talk is very polished and it seems like the speaker has total command of the subject. Things like Live Coding on-stage, usage of humor, and even acting parts of the talk make the talk a memorable experience for the audience. But what does it look behind the scenes? How are such talks are prepared? These stories are almost never told. In this blog post, I am going to share with you the story behind such talk, “Climbing Up Injector Trees”. This talk is a Duet talk: Kapunahele Wong and I presented it during AngularConnect, exploring the behavior of Angular’s Dependency Injection in various scenarios. We used a mixture of live-coding and slides to show and explain various aspect of Angular’s DI resolution algorithm. Where did the talk idea come from? How was it born? A few minutes later, everyone in the group got up and started dancing Salsa. The Angular community is so much fun! We decided to meet again the next week, and to have each of us write a short abstract for the other person’s talk idea. That would make the process more interesting, and also make sure we are on the same page. The next week we went on another call, where we polished the talk abstracts and submitted them. How is your talk relevant to this audience? Injector Trees are hidden deep inside the guts of Angular. They are an essential part of the framework, yet, they are often overlooked even by experienced developers. 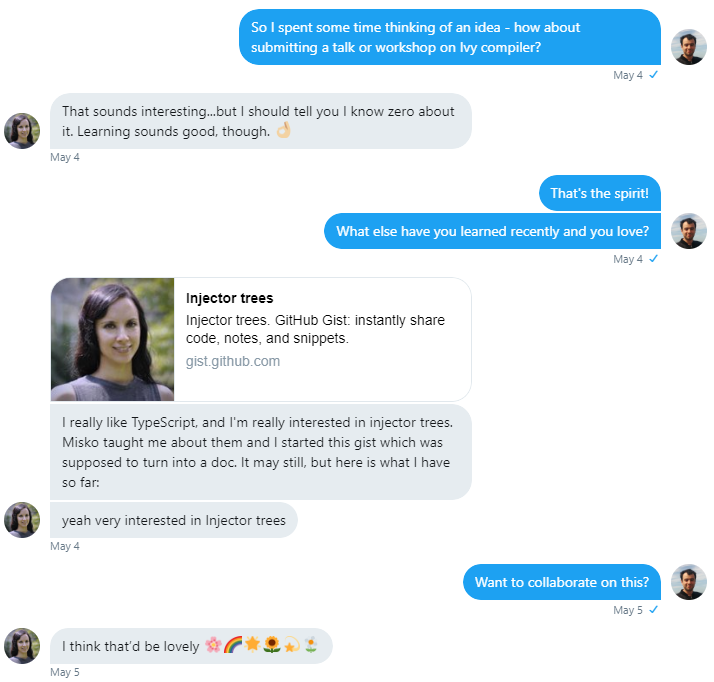 Our talk aims to change that by bringing Injector Trees to the center of attention and explaining the way they work in a fun, memorable way. For most of us, garbage collection just happens. But did you know we can make poor choices that lead to memory leaks and degraded performance? In this session, you’ll learn how the garbage collector works and how you can regain control of memory management. Performance in, garbage out. No leaks allowed! As developers, we are always striving to build faster, smaller apps. However, we sometimes face issues that we may not even know are related to garbage collection. Like a black box, the garbage collector performs its work under the hood. As result, most of us can get by without understanding it. Nonetheless, when we examine its inner workings, we can leverage that knowledge to dramatically improve our app performance. In addition to these talks, I also submitted a talk about Abstract Syntax Trees together with Craig Spence (seems like I got something with trees…). A Happy Mail, Time To Work! So we had to start working! We did have some documentation draft Kapunahele wrote a few months before, so we used it as a starting point, and set a meeting to brain storm about our talk. Due to some personal circumstances, we only met about a month later, at August 16 and started planning. We still had 2 and half months until the conference, so we took that meeting lightly. Eventually, the Sloth turned into a GIF in one slide, the cats didn’t make it to the talk, and we actually created a quiz but later decided to ditch it. More on that soon. These three diagrams are just three different approaches of showing how Angular looks for a dependency in the ElementInjector and then the ModuleInjector trees. Eventually we didn’t use any of these diagrams — rather a much simplified version that matched the examples we live-coded on stage. But they helped us wrapping our heads around the subject. At that point, I started writing some code to test our understanding of the concepts and to verify they worked the way we thought they did. I started with prototyping some quick app on StackBlitz, which would later become the basis for our first demo. We can start with a quick role play, where Uri asks Kapunahele why his Component gets a different implementation of some service than he expects. Then Kapunahele says it could be related to the dependency being defined at the Element Injector level, at some level above Uri’s element, and Uri is like: Huh? Element Injector? What’s that? Cat searches the trees for food (its dependency), and has a preference for the Elements tree (why?) so it searches there first. If it doesn’t find there, it falls back to the Module tree. We can use this story to explain the algorithm in a fun and memorable way. We then do a few code samples using the cat/tree metaphor — perhaps we can even role-play them / get the audience involved? Start with Module / Service / Component (that everyone already knows), then move on to defining a dependency on one of the component and introduce the Element Tree. As you can see in the final talk, the cat didn’t make it, but we did stick with the overall structure we outlined. There are two trees. ModuleInjector and the ElementInjector — The way Angular searches through them. That was what we wanted to teach people who attend our talk. 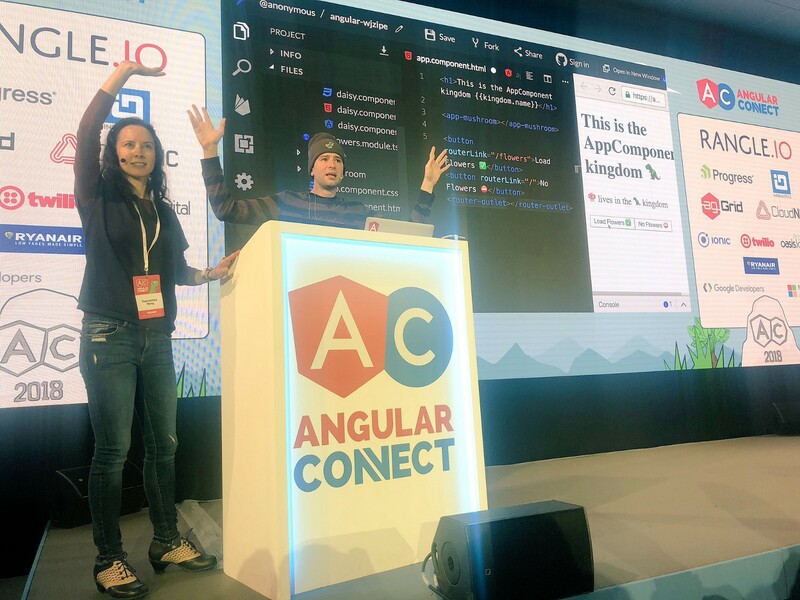 Eventually we also had another takeaway, which is showing the audience how to quickly experiment with various features of Angular using StackBlitz, just like we did when we prepared the talk. We also started looking into @Host, @Self and @Optional, and I used BigTSQuery to look for how people use them in the wild, but we ended up removing that part as we already had enough content for one talk. The next week, Kapunahele wrote a quick demo to experiment with the ModuleInjector tree (and also content projection). If you look into these initial code samples, you will find them much more complex than the samples we ended up using in our talk. Simplifying the samples was where we spent most of the next month. How does Transclusion affect the resolution? How do lazy-loaded modules play together with different provider implementations. (There are two different implementations depending on how you inject it — in the lazy module or in the component). Compare lazy vs standard. 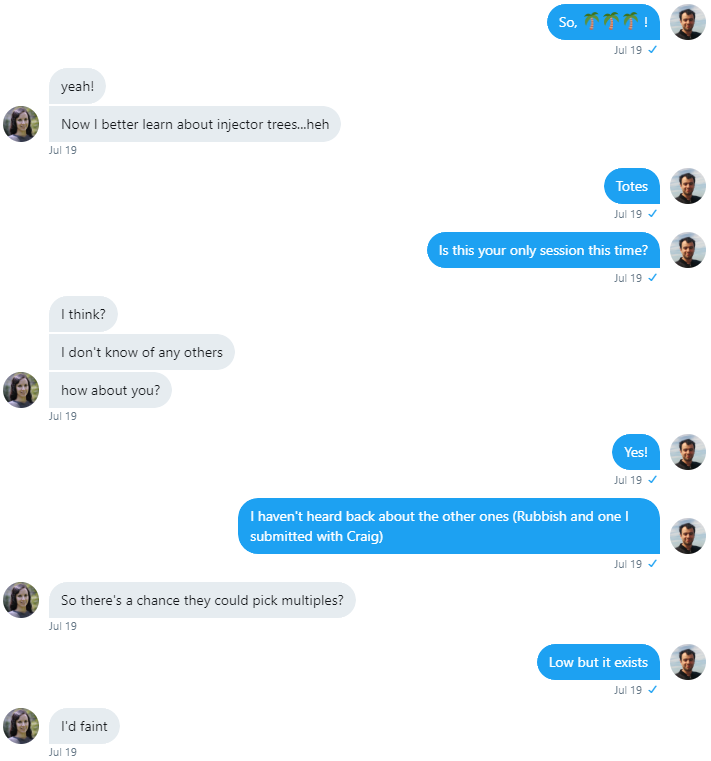 In addition, I shared some of what we learned in our research so far in a blog post: “Transclusion, Injection and Procrastination”. This helped us summarize our research, and also get some feedback from the community just before the talk. For instance, Lars Gyrup Brink Nielsen pointed out that Transclusion is now called Content Projection, so we updated our slides accordingly. At that point, I suggested to Kapunahele that we will live-code the demos on stage. As she took the “instructor” role in our presentation, she would have to do most of the live coding. She told me that she fears this was not going to work out — as she tends to get confused and make silly mistakes even when there is a single person watching over her shoulder, let alone a room for of people. Nevertheless, we decided to at least give it a chance. The following week was quiet intense — we met 3 more times, spending several hours each time doing dry-runs while iterating on the slides, simplifying the diagrams, crafting the live-demos we were going to code, and creating a GitHub repo with a different branch for each of the demos we were planning to show. At first, Kapunahele did make a lot of silly mistakes, just as she thought she would, but after some practice (and preparing some code snippets), she started feeling more comfortable and as you can see in the final talk, she rocked it. I also started working on the a small quiz app using Firebase and Angular— we wanted to let the audience vote for each for the demos we show, to tell us what they think the outcome would be, just before showing the actual result. We only had one week to go! Ariella and I traveled to London a week before the conference, so I took some time off working on the talk. Kapunahele kept on improving the slides and practicing, and we finally met the night before the conference. We did our first face-to-face dry run, and timed it 36 minutes. Not too bad considering we also updated the slides and took some notes in the process. We also decided to ditch the quiz, as it seemed like we don’t have the time for it. We did another dry run the next day, and a final one just before going up on stage, which we timed 32 minutes. Finally, we felt we were ready for the real thing! So What Does It Take to Create a Talk? We met 2 times for coming up with talk ideas, polishing them and submitting them. We met 9 more times online to work on the actual talk, and then did 3 dry-runs in person just before the final talk date. I don’t have the exact figure, but I believe we spent about 20 hours in total working together on the talk, in addition to some hours we spent individually researching between our sessions. About half of the time was spent on learning the subject, researching it and experimenting, and the other half on making the slides and practicing. We ended up with a 24-page document containing a mixture of research results, ideas, and random thoughts we had while preparing for the talk. We moved from working on the research document to working on the actual slides about two weeks before the conference — that is when our research was done and we felt we were ready to formulate it into a talk. Some of the things we worked on, such as the quiz or the part about @Host didn’t make it into the final talk. This is something usual — I always find myself preparing more content than I actually use/present in my talk. What makes your talk great is not the content you put it, rather the parts that you decide to leave out. 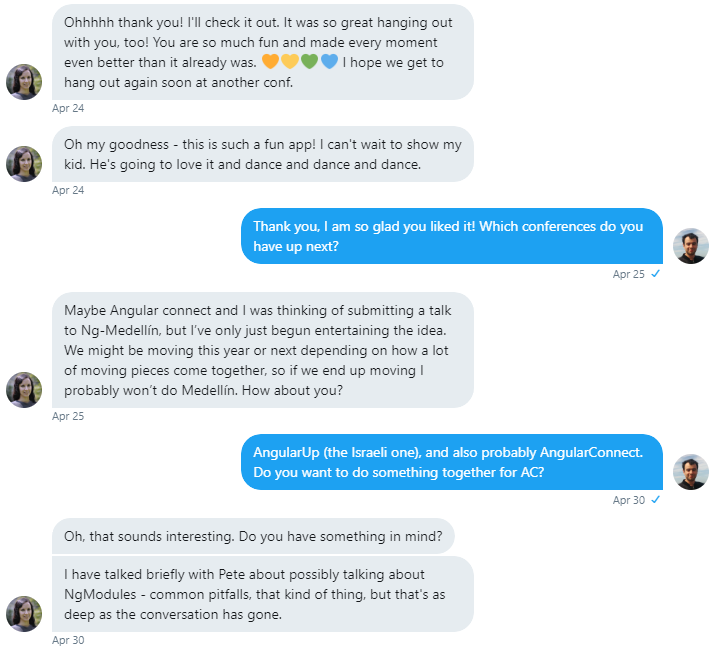 So here it is, the full story behind our AngularConnect talk. Did you too give a talk at a conference? How did you prepare? What did your process look like? I’d love to read your story too. And if you haven’t given a talk yet, now is a good time to start!